This tutorial requires that Monflo Server and Monflo Client apps are already installed on your computers and that you have an active Mirillis account. Run Monflo on your Server PC and enter your Monflo Account Username and Password and click Login button. Successful login to Monflo service is displayed with a popup info. Login status can be also checked in Monflo - on the bottom of the Monflo window. Please make sure that Monflo Server is running on Server PC and its status is Logged in. 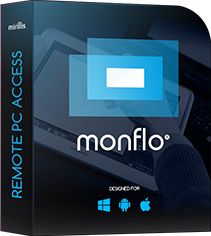 Run Monflo Client app on the PC you want to remote from. On the login screen please enter your Monflo Account Username and Password and click Login. After successful login you will see computers list screen. This screen shows a list of your PCs and there should be your Server PC available. Click your PC to establish a connection. Monflo Client app starts connecting to Monflo Server on your PC - connection popup is displayed. After successful connection you will see a window with view of the desktop from your server PC. Now you can start to remotely control your Server PC and play your favorites PC games remotely on your other Windows PC. To keep your PC secure every new client device that connects to your PC for the first time must be authorized. To authorize device please go to your server PC and confirm device authorization.